When ordering a rechargeable flashlight, be sure to buy an extra battery. You never know when you’ll need it. Blauer offers a variety of material choices to fit your budget Blauer garments made with the original waterproof, windproof, and breathable GORE-TEX fabric have been keeping officers warm, dry and comfortable for years. Blauer and Gore partnered to develop a featherweight reversible 3-layer rainwear fabric that is often copied but never duplicated. The one ply reversible rainwear is lightweight, highly breathable and meets the ANSI 107-1999 Standard for High-Visibility Safety Apparel. Blauer outerwear and rain shells with Gore-Tex fabric continue to set the performance standard by which all uniform outerwear is measured. The makers of GORE-TEX developed a superior fabric for public safety. CROSSTECH fabric is durably waterproof, windproof, and breathable like the original GORE-TEX. It is also a barrier to blood, body fluids, and most common chemicals found on duty including gasoline and motor oil, hydraulic fluid, battery acid, and AFFF (firefighting foam). Blauer outerwear with CROSSTECH fabric is certified to meet the NFPA 1999 Standard for protection of first responders. The revised 2002 edition includes a requirement designed to prevent heat exhaustion called Total Heat Loss (THL). CROSSTECH passes THL with ease and Blauer garments with CROSSTECH fabric are the most breathable NFPA compliant products available. They have been referred to as Commando sweaters on steroids. Ordinary sweaters look good and are excellent insulators, but as outer garments they allow wind to penetrate. Blauer sweaters with WINDSTOPPER liners are completely windproof and offer the ultimate mid layer wind protection. WINDSTOPPER sweater liners are available in several styles including a hi-visibility reversible version with reflective striping. Trippi’s Uniforms carries Blauer outerwear because they comply with the industry’s highest standards. B-DRY is Blauer’s less expensive version of waterproof, breathable fabric similar to GORE-TEX. It is incorporated into a variety of outerwear styles. Flying Cross has provided quality uniforms since 1842. They operate four of their own union manufacturing plants in the USA. This offers them the distinct advantage of paying closer attention to detail, controlling quality and delivery. It also enhances Flying Cross’ ability and versatility to offer custom-designed uniforms including dress coats, shirts, trousers, and outerwear. They offer the best brand name fabrics and superior inner linings to enhance the look, drape, functionality and longevity of your uniform. So whether it is in-stock or custom garments, Flying Cross’ manufacturing advantage provides you with consistently better looking and better fitting garments. At Flying Cross, they want to help you to look and feel your best because they truly understand “The Power of Appearance”. Trippi’s Uniforms carries Flying Cross uniform shirts because they produce the toughest and most comfortable Police, Fire/EMT, and USPS uniform shirts available on the market. 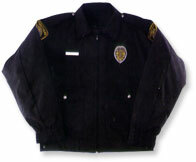 Our #1 selling police uniform shirt is the Poly/Rayon All Weather Deluxe Tropical weave series. These long sleeve and short sleeve styles are sturdy, yet breathable, and retain their body and shape. Wearers attest the Deluxe Tropicals become more comfortable after each machine washing. Available in many colors and styles, it’s the choice of many agencies nationwide. Trippi’s Uniforms also offers trousers by Flying Cross in a number of styles and pocket varieties. Choose from 4 pocket, 8 pocket, or cargo pocket style pants to match your department’s specified shirt. Offered in 6 colors, they include the Freedom Fit II waistband and Snug Tex to keep shirts tucked in, plus Lintrak creases front and back for enhanced appearance. All Flying Cross trousers come with standard quality features like a brass metal memory lock zipper for longer life, and extra fabric built in to allow for the waistband and seat to be let out. We offer hems on all pants purchased at Trippi’s for free while you wait! Add $10.00 for a stripe and $15.00 for piping. Since 1967, Propper has produced the highest quality apparel for the Dept. Of Defense of the United States of America. Their fundamental purpose has been to design, manufacture and deliver the highest quality Battle Dress, Class A, and Ceremonial Dress Uniforms. Propper has recently offered this same product to retailers such as Trippi’s Uniforms in order for us to supply military and public safety apparel to you. Propper is one of the few apparel manufacturing companies in the U.S. to have earned an ISO 9001-2000 quality certificate from the British Standards Institute, and an ANSI/ASQC Q91-1994. These certifications apply to the entire quality assurance system, from the inspection of raw materials, through process inspections, to the critical review of the quality of finished garments sent to customers. Propper is also proud to be a Certified Army and Air Force Exchange Service (AAFES) Uniform Supplier. Trippi’s Uniforms offers the full line of Propper BDU pants and matching shirts at a great price. Customers can choose from 100% cotton, poly/cotton Rip-Stop, or poly/cotton twill blends all sewn to Military Specification MIL-T-44047E. Fabric color choices include 8 different camo prints as well as black, navy, olive, khaki, and sage green, and are all offered in wide range of sizes. Trippi’s Uniforms carries 5.11 Tactical Pants in navy, khaki, and black, as they have been the choice of federal, state, and local law enforcement for over 20 years. This pant’s action waist allows for comfortable freedom of movement and its cargo pockets can store a cell phone, flashlight, spare mags, handcuffs, and knives. Made from 100% cotton canvas, it has reinforced seat and knees for added durability. Trippi’s Uniforms in stock price is $50.00. Also, please ask about the matching 5.11 Tactical shirt and vest. Less expensive alternative to Blauer and Flying Cross with similar quality apparel. Great for a Cadet, Police Explorer program, or Security officers. Uniforms for Law Enforcement, EMT, Firehouse, and Security. Trippi’s Uniforms offers a variety of duty belts and all the specialty gear to fit on them. We stock handcuffs, pepper spray, knives, expandable batons, search gloves, badges, watches, sunglasses, field bags and much more. We are constantly updating our stock to provide our officers with the latest and greatest accessories. Brands we carry include Safariland, Uncle Mike’s, ASP, Bianchi, Hatch, Strong and more.